Ten questions on Marie Antoinette, the Queen of France who allegedly said of the French peasants, "Let them eat cake". 1. Maria Antonia Josepha Johanna was born in 1755 in which country? 2. By what name was Marie Antoinette known amongst her family? 3. How old was Marie Antoinette when she married the future Louis XVI? 4. 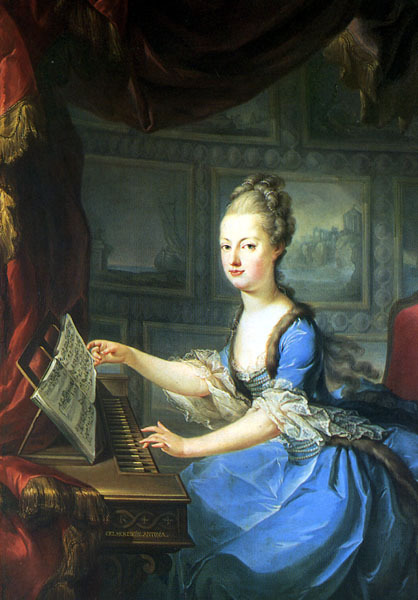 Following her marriage to Louis, why did Marie Antoinette take seven years to fall pregnant? A. She suffered bouts of insanity. B. Louis was a rumored homosexual and Marie's child was fathered by another man. C. Her husband had a penile deformity. D. She regularly moved back to her family home as she detested Louis. 5. What pastime did Marie Antoinette enjoy? 6. A legal trial about the fraud of what precious item began the downfall of Marie Antoinette? 7. What tragedy struck Marie Antoinette and Louis in June 1789? D. A run on the Paris stock market saw them lose millions. 8. What did Marie Antoinette advise her husband to do following the fall of the Bastille? 9. Following the execution of her husband, what "title" was bestowed on Marie Antoinette? 10. Guillotined in 1793 at the age of 38, what was the eventual fate of Marie Antoinette's body? B. It was dumped in an unmarked grave. C. Her body was eventually buried in Notre Dame under the orders of Louis Phillipe. D. Royalist sympathizers took her body back to her homeland.